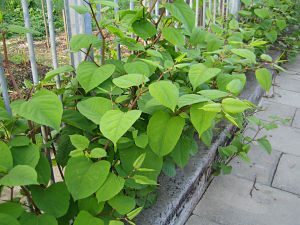 Japanese knotweed is a non-native invasive plant. • Saturday, March 30th, 2:00 – 3:00 p.m.
Co-sponsored by Harwich Conservation Trust, The Garden Club of Harwich, and Blue Flax Design, this educational presentation focuses on the problems that invasive plant species are causing in our native ecosystems. The presenters will share life cycle facts and misconceptions about these plants as well as answer common questions. Which species are the biggest ecological problems locally? Are there other potential invasive species of concern in the region? What can homeowners and property managers do to control the spread of invasive plants and ensure the survival of native species? After the presentation, participants will have the option of joining a walk outside, where we will learn to identify several plants within a short distance of the Community Center. We’re expecting this to be a popular talk and need to gauge the amount of seating as well as post-talk walk groups, so we ask that you register in advance by email to: events@harwichconservationtrust.org.